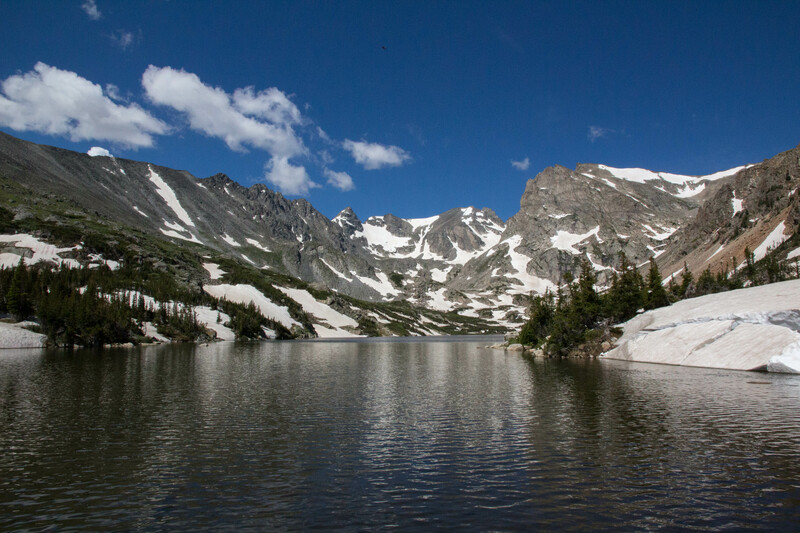 The 2-mile hike to Lake Isabelle is an easy and extremely beautiful trail. 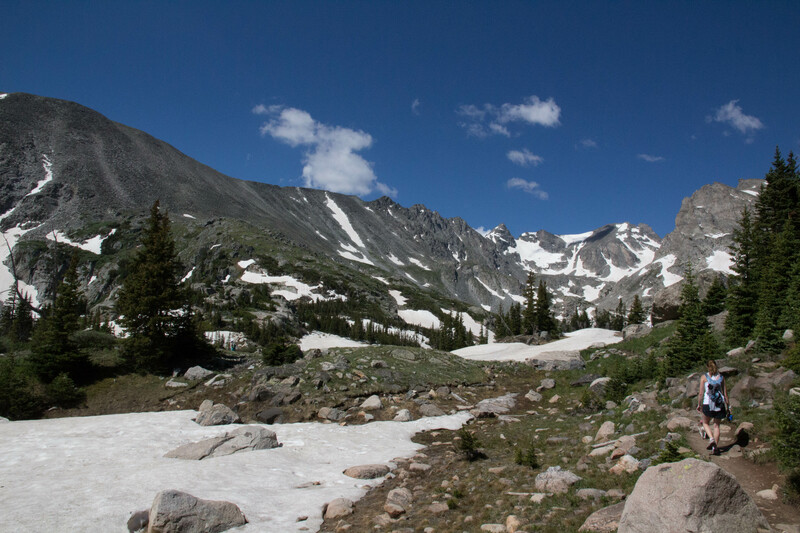 Elevation: Peak elevation is a smidge under 11,000 feet, and the elevation gain over the hike is approximately 600 ft. Difficulty: Easy-Moderate. There are some rocky areas, some wet areas, and one rather thrilling bridge, but mostly this is a well-maintained, gradual incline with spectacular views. A (fit) friend hiked this with me a day after arriving from sea level and with a baby on her back. 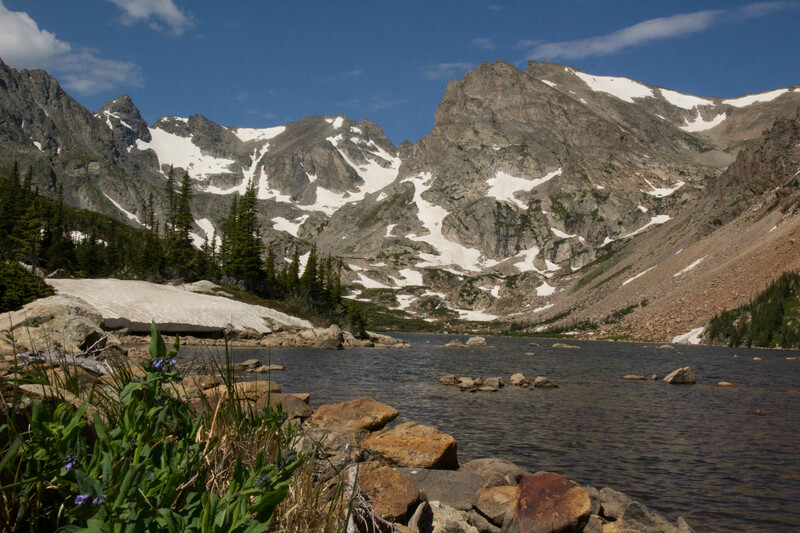 Trailhead: Long Lake Trailhead in the Indian Peaks wilderness. There is a $10 entry fee (in July 2013). 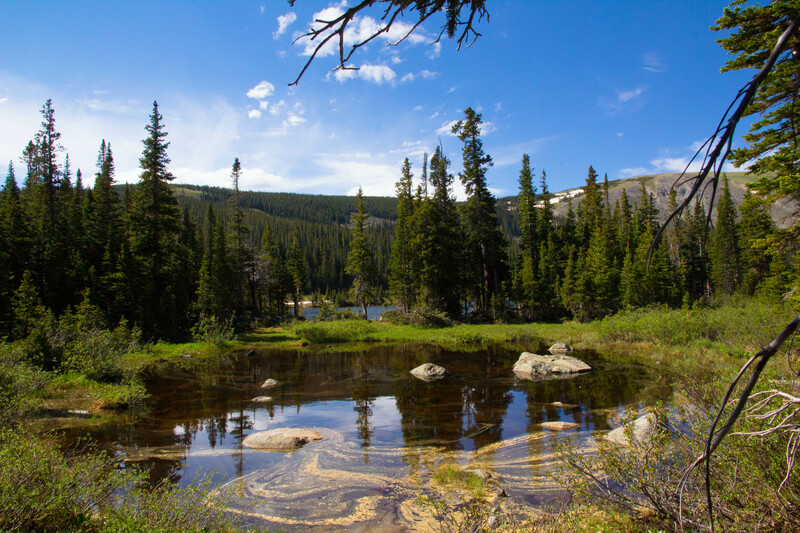 Because Long Lake is a popular trailhead with limited parking available, plan to either arrive early and secure your spot or park in a less convenient lot. 4-legged friends: Leashed dogs permitted. Note that at the time of my visit, the parking lot at the Long Lake trailhead was closed, and we parked at the Brainard Lake lot. This added a pleasant two miles to our route. Several trails start at the Long Lake Trailhead. To reach Lake Isabelle, follow the signs for Lake Isabelle and Isabelle Glacier. The trail starts with a quiet meander through a wooded area, broken by picturesque ponds and rocky meadows. I am not a good enough photographer to capture how amazing this little pond was, full of swirling colors, a rainbow of moss and algae. As you begin to gain some elevation, the views become more wooded, but still allow occasional glimpses of the mountains. We crossed a quick stream and skirted the edge of a lovely meadow, then began a steeper ascent towards the lake. And here’s where it became spectacular. As you climb up to the lake, you’re transported to a new world, one that is unexpected and exotic. I read one description of this trail that compared this to the Swiss Alps. I have never been there and so can’t say how much of an exaggeration that is, but… Coming up out of the trees to this view, that blue sky, the sound of glacial run-off, the mountains jutting up through it all….it was pretty spectacular. There is no “You are Here” sign when you reach Lake Isabelle itself, and the trail continues on to Isabelle Glacier (another 2.something miles further). A trail branches off to the left for visitors wanting to explore the lake, and we walked a ways around and found a place to sit and picnic. The return to the car was quick (especially as the gathering clouds threatened rain–and then followed through, thankfully just as we reached the car), and we were glad that we’d arrived early. Not only because of the darkening skies but also because there were many more people hiking up as we went down. If we’d begun much later than we did, our hike wouldn’t have been so quiet. I enjoyed this hike so much that I returned a week later, when a friend visited from out of town. Here’s one more shot of Lake Isabelle, from a different resting spot. About a week later, I went back up to Lake Isabelle. Conditions were a bit drier and just as lovely.